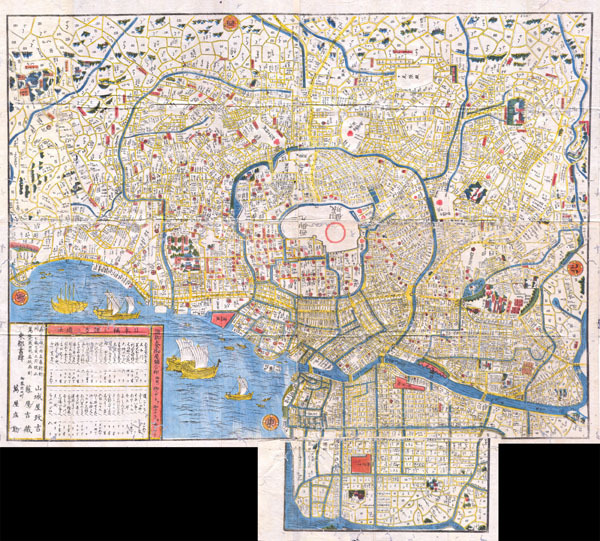 This extraordinary item is a hand colored Edo Period woodcut map of Edo, or Tokyo, Japan. Impressive size and detail. Produced in the mid 19th century Japanese woodcut style, this map is a rare combination of practical and decorative. Ships and waves decorate the harbor and there is no specific directional orientation. All text seems to radiate from the center of the map. Folds into its original sideboards. A must for any serious collection of Japanese cartography. Very good condition. Folds into original covers. Minor wormholes here an there – see image. Some old Japanese style backing and restoration.